J'ai faim...en voyant ce régal...c'est ainsi que j'aime les betteraves, non en petits cubes comme on le voit toujours...cette salade me fait très très envie..
Yum and simple salad. I would eat this for lunch now. I love the last photo! 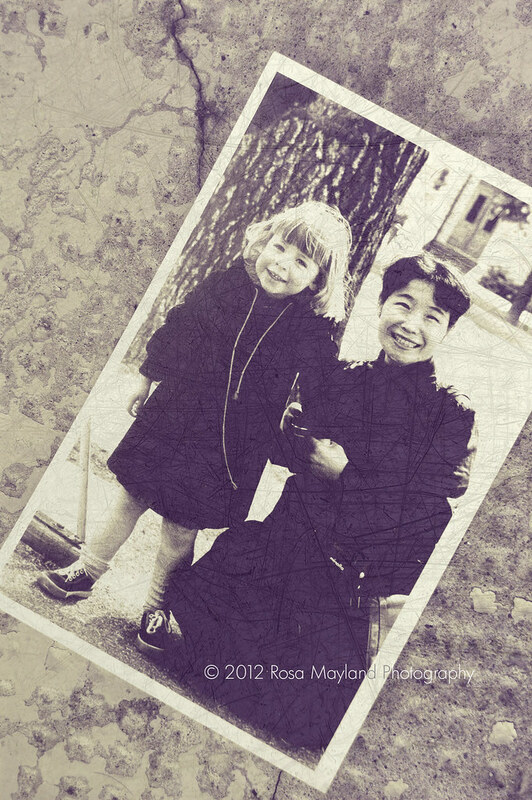 What an adorable photo of you with the Japanese lady Rosa. No wonder they wanted you to pose with them. I don't ever want to be cold again in my life, so we "follow the sun" when it moves south and then journey back with it as it goes north. As a Jimmy Buffet song would say, "I keep my flip-flops in Dixie." Your beet salad is gorgeous and the egg is perfectly cooked. My husband would hug you for a plate as I don't prepare beets for him. (shame on me!). The photo of the snow covered tree is absolutely beautiful. Jolie et délicieuse cette salade avec l'oeuf mollet! You looked so cute in the picture! J'adore ta belle salade hivernale Rosa! Bon week end! Beets are delicious and so healthy for you...perfect with cheese too! This beet salad looks delicious, I love their deep aubergine colour! I had no idea about your heritage. Danish, Viking, and Swiss...how exotic! I feel the histories of our ancestors are always fascinating. that picture with u and the japanize lady is so timeless perfect, very magical. I love your pictures especially the first one and the one with the nuts. nuts have some attractive lines, fascinating. In general great heathy recipe and a post written with lots of passion. I enjoyed my read. Who would say "cheese" on your pretty photo ? An appetizing dish and a wonderful tree. Magnifique écriture et photos. Que du talent. Bon week-end! Gorgeous salad :-)the pics r so awesome n loved ur post! beautiful pics, as always, love the way the yolk is slightly runny its just perfectly cooked! ur baby pic is so adorable, im curious to know why hair colour would change that way, its fascinating! Beautiful salad Rosa! Looks almost too good to eat! I like the earthy flavour of beets and their lovely colour! Your salad looks delicious and original! Beautiful photos! love the salad recipe! You are a girl after my own heart, Rosa! I love every component of this dish! Love this Rosa look amazing and delicious! your egg is perfectly cooked. took me a long time to master the perfect soft boiled egg, and omelets too. rosa may! that baby/child photo of you is PRICELESS! So stinking cute.! That is one perfect egg. A great way to showcase it, too, with the bright hue of the beets. What a beautiful meal - the egg just beckons. I wish I had cold-weather genes since I live in a cold climate. But I do look at it as a time to regroup! Your childhood photo enchants! Delicious! Especially with that runny egg! I really like your attitude about regaining health after the winter "layer" is added from indulging in more savory and heavy foods. The Salad is a work of art! Savoureux, simple et coloré, j'aime beaucoup ! Il y a pas si longtemps j'ai préparé de la faisselle maison au lait de chèvre : hyper rapide et délicieux. The salad looks like a painting and beets looks like a velvet sheet of paper. Gorgeous click! Hehehe Japanese tourist part made me laugh. Oh you look so cute in that picture! I love your beets salad. Beet is my favorite but never had it with cottage cheese or eggs. Got to try this. Loved the description of walnut in that pic and that runny egg is so appetising. I used to love the blanched beets in my salad when i was working in London. The beets were the reason i looked forward to lunch. Your salad looks delicious and the photos are all fab as always. Beautifully written, Rosa. While you are having a severe winter, we have had very warm temperatures here in Georgia-crazy, isn't it? Your egg salad with the beets, walnuts and runny egg looks divine and the photo of the walnuts in the silver footed bowl is awesome. What a lovely, well rounded post Rosa. Beets...how could I not love this dish. And...BTW...your plate presentation looks soooo happy! Such a simple and beautiful salad! deliziosa la tua insalata, adoro la barbabietola e so che si sposa benissimo con il formaggio...foto stupende!!! specie quella con le noci! bravissima mia cara ti seguo sempre con affetto! Querida Rosa me encantan las fotos Con bellas imágenes ,el huevo está muy perfecto una mesa de ensueño,abrazos hugs,hugs. delicioso plato y preciosas fotos como siempre. Saludos. A wonderful story thank you for sharing with us. I would love this beet salad for dinner! You look so cute in that photo!! Dear Rosa, I enjoyed very much your post. It is very interesting to discover our roots and what makes us who we are. Thank you for sharing this. 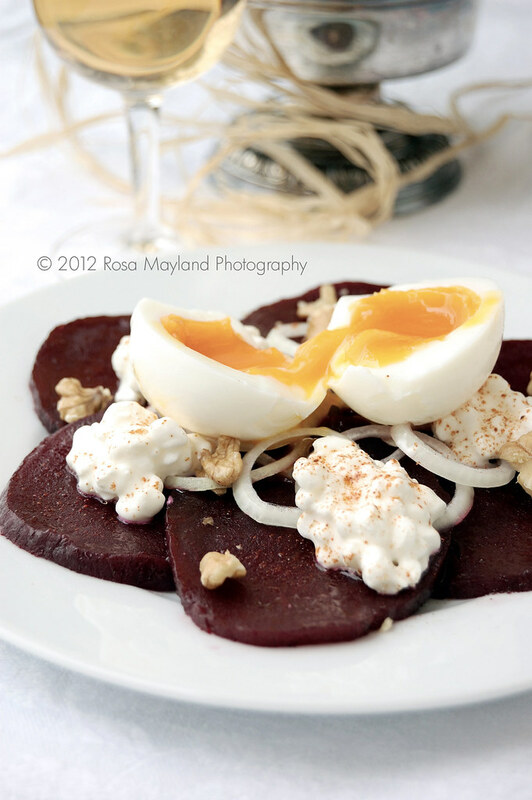 The beet salad and egg is very nourishing and a good recipe. Runny eggs are my favorite - this looks delicious! Beautiful salad. Love, love, love beets. I always have some preserved in vinegar and use them all the time. Just reading this post made me feel the cold! 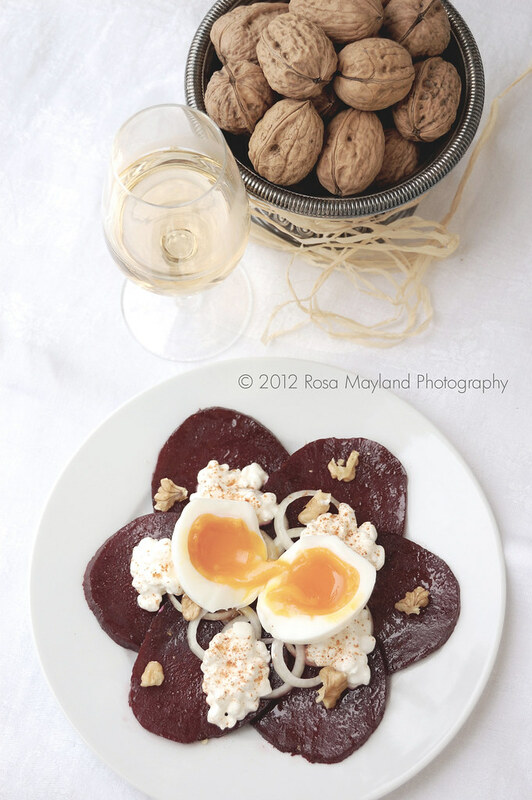 This beetroot dish is so pretty - love the colours - and the runny egg looks gorgeous. It looks like a wonderful salad. wow I love that photo of you and your mother...really really beautiful. 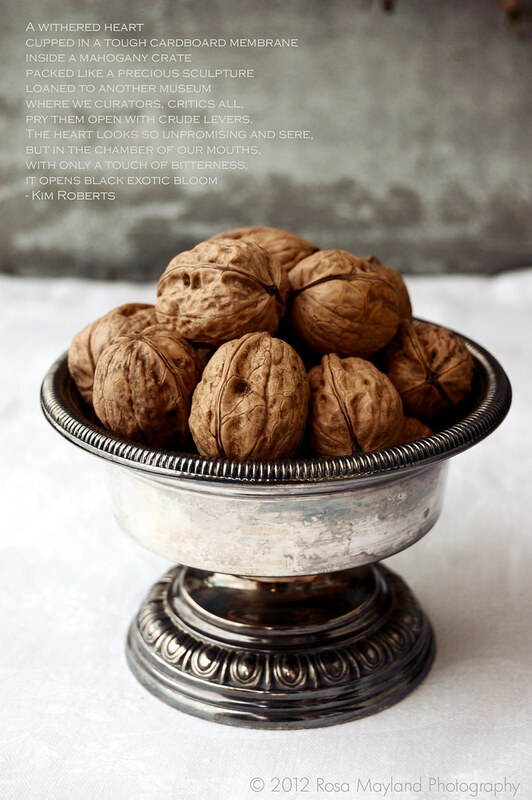 And my 2nd favourite is that bowl of walnuts ;-) You are such a talented photographer. ANGIE'S RECIPES: Thanks! In fact, this is not my mother, but a Japanese tourist... ;-) Yes, without the egg, it isn't quite the same, LOL! Woah!! That egg is cooked to pure perfection!! Beautiful memories and the salad looks so refreshing. love that photo of walnut! I am really missing the snow (we rarely see it here) and I like the cold weather much better. I also like beets and that is a lovely salad. Walnuts seem to go with beets so well. 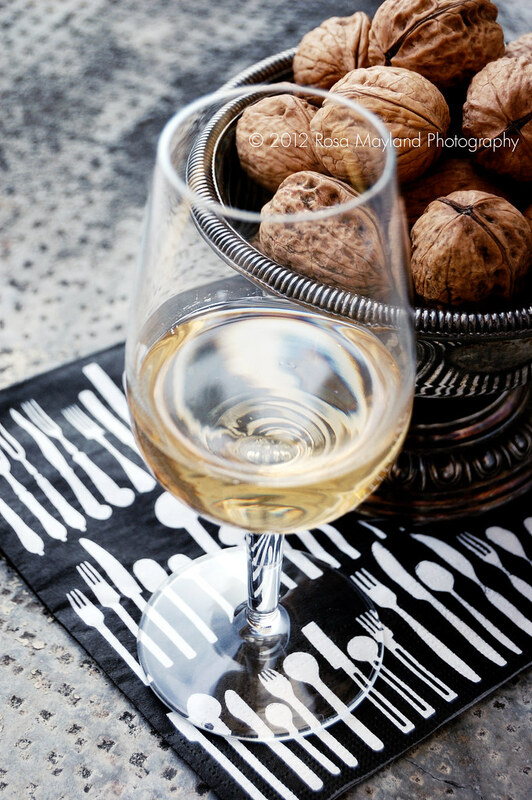 Beautiful post and lovely recipe. Cute photo too! C'est si simple et si bon, j'aime beaucoup la jolie présentation en fleur. Avant je mangeais beaucoup de betterave car j'adore ca, et puis depuis que je suis en Suède j'en mange moins, je pense qu'on n'en trouve pas de prêt comme en France dans les supermarchés. Mais ta recette me fait envie, vivement que j'en remange. Bonne semaine! Le genre de salade que j'affectionne. Your photos make anything look delicious. i love beets in any form, but with that runny egg, they're especially intriguing. i like all the seasons too. They each have their advantages. Bon, ca c'est une addiction que je ne partage pas avec toi. Mais comme toujours j'adore tes photos, et particulierement celle des noix (aussi la petite fille blonde que tu etais autrefois). What a fantastic photo of yours with the japanese lady. Sublime!!! The beet salad looks so delicious and yummy! Runny eggs rock my world ~ always. As do wintery trees topped with snow. Beautiful! I hate repeating myself, but you make it impossible not to, so here it goes: I loved this post! the black and white photo your Grandpa took is a work of art, I love B&W, to me they have a level of expression that colors seem to overpower. I grew up enduring the cold, Illinois winters, but I much prefer the very mild winter months in Texas where I live now. And, I love winter vegetables. Your beet salad looks perfect with the egg on top! I adore runny eggs, yours looks amazing Rosa. As does your salad, so delicious with simple flavours, the way a good salad should be. Your photos are just so beautiful, as always. You really do have an amazing talent. Out in Texas, the spring and the fall times are the most beautiful. I do not enjoy if its too cold, tho I love the snow. What a cute photo Rosa. you haven't changed at all! The ingredients of the salad is calling my name! I would not think of this combo, but it might soon become my lunch! oh how i love everything about this! your history, your culture and that portrait--it's most definitely you! Your eyes haven't changed a bit! Great looking salad, too! Look at that. We were working on beetroot at the same time! I have to know where you found cottage cheese. can't find it t ll here in the south of France. Beautiful, beautiful pictures. The idea of the runny egg yolk and the beets in the salad made me salivate. It sound like a delicious combination. I agree with you, love of cold or warm weather must be in our DNA. All I can say is I love seasons even though I do enjoy summer as much as the next person. Rosa, you were so adorable (well, you still are), but what an imp! I can almost hear your laughter looking at that wonderful photo! Spring has arrived in Nantes after a much-too-short winter and almost no snow... and husband has been doing the cooking which means heavier dishes. I love the look of this pretty salad and the flavors and textures must be wonderful. Beautiful too. Your photos are spectacular Rosa. We love beets at my house...this is a perfect lunch as far as I'm concerned. Another amazing post! And a great looking salad! Totally up my alley! I'm with you Rosa. I love cooler weather. You were such an adorable child!! Lovely post. Beets are a staple in my cooking. I love them every way and post more recipes with beets than any other veg. And the walnut shots are simply gorgeous! This is a gorgeous idea for a salad...such a lovely array of texture, color and flavors! Rosa, the pictures are awesome, especially the one from your grandfather....as for the salad, you got me on the runny egg...tasty combination with beets, cottage cheese and walnut...so simple and yet so elegant. Such a beautiful presentation. I'm not a cold weather person at all. I think it is in the DNA. Love the runny egg! That is exactly the way I like to have my eggs :) Oh and the photo of you with the Japanese tourist is adorable! Beautiful as always. For me the egg always has to be runny! Me encanta el plato y los ingredientes!! 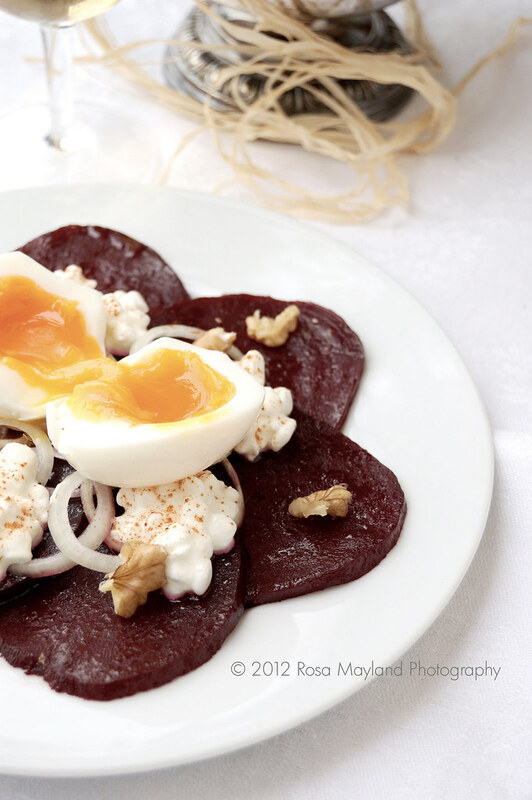 Rosa, I must have this..that runny egg over the beets and cottage cheese is driving me crazy! That said, you have really blossomed into a professional and beautiful photographer. I'm simply awed by your photos. I'm not sure about the weather. I thought I loved cold, until I experienced temperatures below -10C. I just can't cope with them! Maybe it is in my genes after all. Anyway, spring will soon arrive. Lovely salad combination, and the pictures are breathtaking! I like roasting beetroots. Whenever I have the oven on, I throw a couple of them in, well wrapped in foil, and then I peel them and freeze them if I don't need them soon. Wow what a delicious looking salad and the photos are stunning! Such a wonderful photo taken by your grand father! Beet salad is always my favorite. I like the runny egg addition to it. You're so right about diets not working and sensible eating and exercising is the only way to go. I love this recipe! Especially since I started a new healthy blog called beetroot and Halloumi ..:) I would love to feature your recipe there! I'll tweet you about it! While I do prefer the warmer months, I agree that winter is perfect for cocooning with the one you love at home. Love how you've presented it Rosa! Just beautiful. I can't imagine living anywhere that it doesn't snow. This salad looks light but satisfying. Your walnuts look so incredible and vibrant! I've always enjoyed beets and eggs, but have never had them together. And why not? Rosa, you were a living doll in that photo! 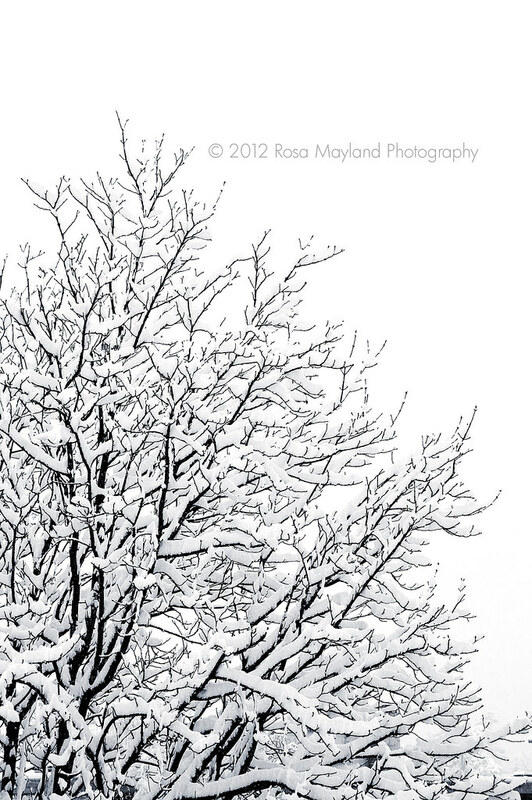 Love the pictures, especially the tree laden with snow. I wish more people believed as you do about food and heatlh, balance without the crazy diets. The beet salad looks great. After what you said about the European cold wave, I can't complain about the bit of rain we have been getting. I was in Spain during that cold spell, and holy cow, it was freezing! My goodness, I had so many layers on I looked like the Michelin man. Your salad looks divine. I love beets. This is just what I need after 20 days of heavy eating in Argentina! So healthy;;on my shopping list tomorrow! The photo of the egg is pure perfection. Gorgeous!